Cubist Jewelry - This is a large bold innovative sterling silver handmade geometric bracelet with a pin closure that wraps around your wrist. The openwork cuff features a large natural freeform Green Amber, from Latvia. 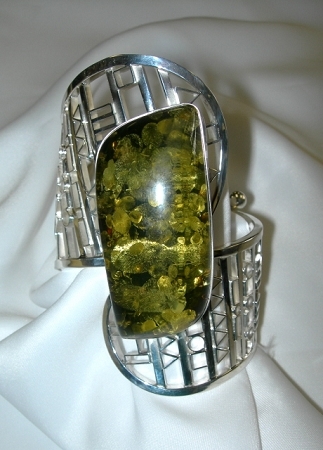 From our Cubism Collection, this is an exquisite handcrafted sterling silver bracelet that is bound to make a statement with its size and intricate detail.The bracelet cuff features a large natural freeform Green Amber that is fully encased in sterling silver. 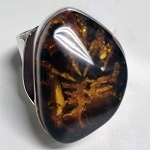 Every piece of amber is unique and will be approximately the same size as picture. The cuff bracelet wraps around your arm and wrist and is constructed from sterling silver tubes of different sizes and shapes soldered together individually. The bracelet is oxidized to highlight the details. A pin closure allows the bracelet to fit somewhat snug on the wrist or arm to avoid the bracelet from turning. The bracelet is 3.8" wide in the front x 1.5" wide in the back. 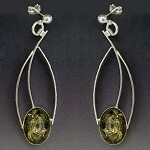 The Green Amber, from Latvia, is approximately 2" long x 1.25" wide (50 mm x 30 mm).